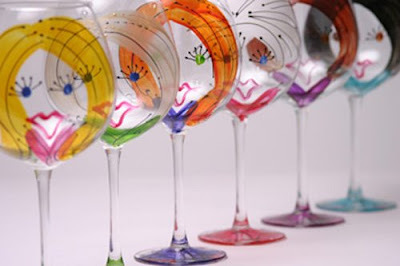 A Client of mine recently came across custom painted wine glasses (pictured above) at a local gift shop and called me ecstatic that she found them. She proceeded to hunt down the glass manufacture; Leslie Hand Painted Glass, and contact them about customizing a set to reflect the beautiful faces of her bridesmaids. She added a little touch and had their names added to the bottom of the stem. I thought it was so darling, I just had to share. Giving gifts to the bridal party is a topic that comes up often. My advice time and time again is to make it about the person you are giving the gift to. I recommend trying to stay away from your wedding colors or any engravings of your wedding date. Think about all the engraved things you personally have held on to. Oh wait, their aren't many. Just because you are crazy about green doesn’t mean she is. Purchasing something that is remonisint of them and not you, will reflect that they were in your thoughts as you carefully picked their gift out; that's more impactful. After all, they have spent money on a dress they probably won't wear again, many times paying for hair, make up, mani-es and pedi-es, and often travel and accommodation expenses. Show them that you are truly grateful that they are apart of your wedding day. What I like to tell my Brides is to take some time to write each attendant a letter of why they are so important in your life, the impact they have had on you, how excited you feel that they are in you bridal party and write how thankful you are to have them in your life. Your thoughts shared are so much more priceless.